Remember when Mary Barra was product chief at GM (before becoming the CEO) and said the company planned to focus on plug-in electric cars and mild hybrids? Well, the mild hybrids bit didn't work out so well, did it? This week in Detroit, she took the wraps off the new 2016 Chevrolet Volt. It has more range, more power, and a larger battery pack. The powertrain is the updated Voltec system, and one has to wonder if it's what will end up powering GM's future hybrids, kind of. Imagine the Voltec system with a much smaller battery pack and no plug-in gear. That's basically the setup you'll find in Toyota's Hybrid Synergy Drive or Ford's hybrid system. Only, this modified Voltec setup would have more power than those competitors' systems—and who doesn't love more power? Now, shove that system in the next-generation Chevrolet Malibu, slap a hybrid sticker on it, and VOILA! You have a mid-size hybrid sedan with more power than the competition, competitive if not better fuel economy, and mainstream styling and packaging. Is The 2016 Chevy Volt GM&apos;s Future Hybrid System In Disguise? 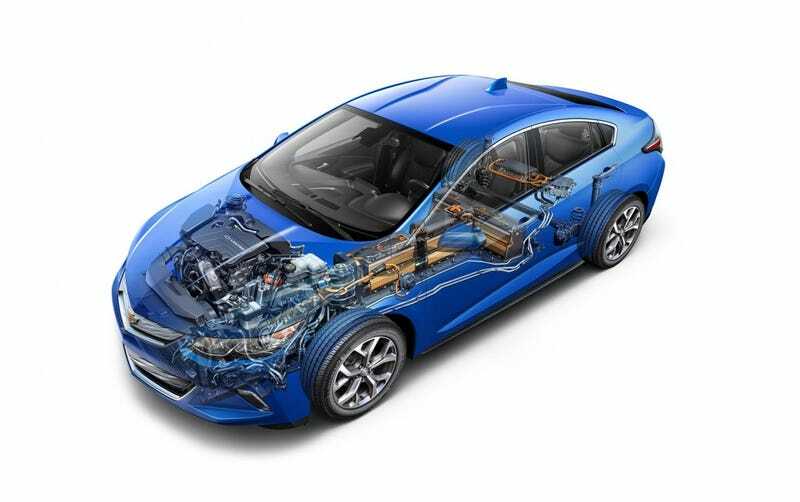 Head over to our article on Green Car Reports above for a full breakdown on the new 2016 Chevrolet Volt's powertrain, and why a modified version might indeed be GM's future hybrid system. Sure this is all speculative, but it answers the question: How can GM not offer conventional hybrids? Wonder what&apos;s changed on the Ford GT for production?